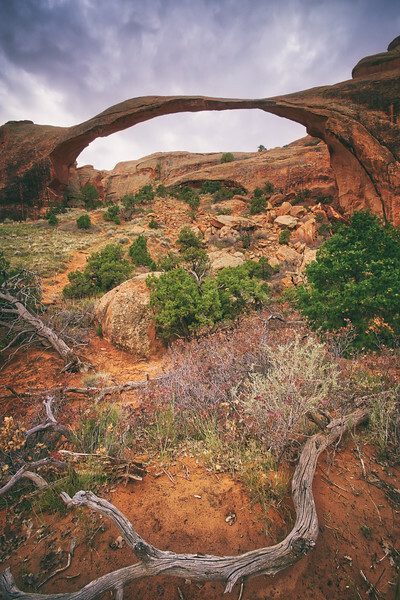 This image was taken in the Utah National Park called "Arches" - you might have guessed from the image :D It is a really great place to visit if you own a camera or are generally interested in ... life! I had never seen such stone structures before and was quite stunned. I later found out that a while ago, people were able to walk on top of the arch that you can see in the image - but at that time, the arch was also way thicker than it is now. One night, when no one walked on it, there was a massive noise and half the arch just simply collapsed. Imagining that this could have happened when there are people on it makes me shiver, but since then, of course, there is no "legal" way up. You do however have the occasional youth that climbs up anyway and walks across it.